Just got home. What a great day. The Cafe pinged all the way. I'd thought about colder plugs last night due to the heat and slow riding. Bugga. All that followed commented on the ex note and smell of R30. The Ulladulla ride had about 60 bikes and raised $20+K. Pics when I can upload. 88 riders registered (only about 70 turned up), $24,000 raised. I'll be setting off soon. The start point of the Coventry ride is the Triumph factory at Hinkley. The route includes the Coventry ring road. That road is not somewhere I'd choose to ride; there are combined entry/exits with quite short ramps. Not ideal for a bike without indicators! Really good weather, unlike last year. Must have been 200 bikes and a fair number of scooters gathered at theTriumph factory at Hinkley for two different DGR rides. There was a fantastically well done chopperised scooter; looked pretty silly being ridden though! Classics apart from mine were three Vincents, a Velocettel, AJS, Ariel, post war Triumphs and a flat tank belt drive Triumph. There was a lovely red flat head Harley Davidson that was in concourse condition. Next to the rear wheel there was a gizmo with a meshed grill that was operated by a small foot pedal. I can only think that this was a siren that used the back tyre to spin the mechanism. So bike may have been a fire chiefs steed. Anyone seen one of those? We parked up in front of the Coventry Transport Museum where many photo's were taken. When I see some I'll put a link here. A very un-distinguished gentleman, sort of rode. A7 away at my sons, A10 bald back tyre, so the Norton it was. Going to meet up with a VMCC run and spot something yellow inside my crash helmet. Then the huge yellow and black bugger crawls across the inside of my visor. The Norton can stop quite quickly and the side stand can be deployed rapidly helmet off and thrown in hedge. 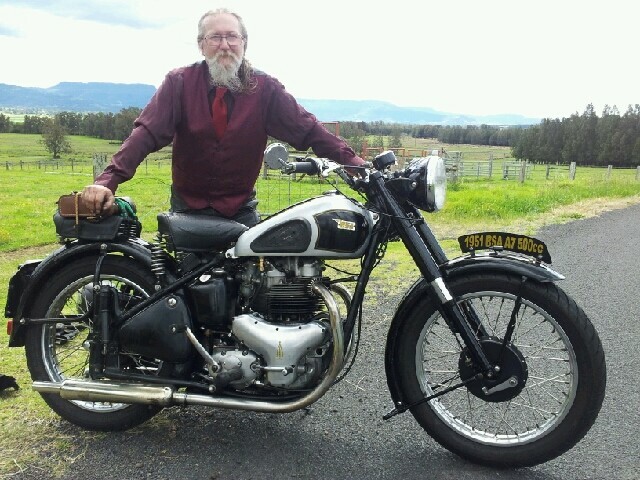 hissy fit over, retrieve Helmet but the dam bike will not start and the carb start poring petrol out again. So I missed all the rides I could have attended, and got home very hot and bothered. I did ride about 25 miles so I hope that counts. An Asian Hornet no doubt! Had a very pleasant ride with a bunch of more than 200 riders... but only a handful oldies, only three bsa, a sloper, a Goldstar an my GF. Picture from the stop at the Swiss museum of Transport. I was one of the few to ride an oldie (not a BSA) in the Solent Run, but at least the weather was great! A couple of Bantams, a B31 and a trials TriBsa was the only BSA connection. We had a good run out in glorious weather in Cambridge. It was a better route this year and very well marshalled. Saw a number of A10s there including one with a chair. I suppose there must have been 2-300 bikes at least, and a lot of interesting stuff in the mix. An awful lot of Hinkley Bonnevilles derivatives mind. I completed the route on my Kawa H1 stroker smoker. The ride in plus the ride round made 63 miles, for 11.5 litres fuel. 25mpg (UK). Just had a look at the leaderboard. The Ulladulla ride comes in 2nd in Australia. I know it wasn't a competition------------------BUT. It stayed dry! Only 2 classics, 1 Enfield Clipper, my A10. Lots of Harleys and some painfully loud exhausts. Perhaps not the best way to endear ourselves to the public. A good ride through Edinburgh nonetheless. Fantastic photo! Fanastic bike that really puts moderns to shame! Fantastic tee-shirt! Fantastic beard! Well done Musky! Quite a few in my ride wouldn't fit. But we "can't look a gift horse in the mouth". They shouldn't mind too much as long as dosh is being raised. No bloody PC at home so had to wait for BT to reconnect our office. Very enjoyable ride yesterday on the Liverpool ride , about 100 bikes classics very thin my A10 , 4 enfields (to oldies ) a Sterling ( a flat tank lookalike ) which ran well some nice Ducatis and a good turn out of Harleys etc . Ride was f**ked up by Liverpool city council who ran a city pushbike /race event and closed roads without much notice .Infact the carpark on the Albert dock who had kindly arranged free space for us as per last year ,weren't even inform that the roads were closing ,as we couldn't get there at all a comprimise was found by the old Higsons Brewery .The route involved going through the heavyest traffic I've ridden for a long time however drivers were helpful pulling over and even blocking junctions to allow us to cross as a group ,no accidents but the bikes did get lost .Clutch took a pasting and boy the oil tank was so so hot . Not sure of the figure raised yet but I've got about £200 to come in plus any more I can wring from people/companies! Pictures later. This event was a first for me and I did the Oxford ride and a great day out it was! The weather helped of course, although bit chilly early on for the 40 mile ride to get to the start. I think just under 500 had registered and judging by the parking area, everyone had turned up, possibly more as well. The marshalling was excellent, especially in the city centre where it became pretty congested in places. It was a great spectacle for locals and tourists as well, most seemed to love the noise and sight of all the bikes, although on a couple of occasions, I did notice women with hands pressed tightly to their ears! Huge mix of bikes but not too many BSAs from what I could see...although tbh, didn't spend ages wandering round. The pic is me at the start.